In version 6.0.3, a single landing page is available where you can access all the interactive guides for installing, upgrading, and setting up Collaborative Lifecycle Management (CLM) applications. This release also includes a removal guide that you can use to uninstall software packages. For details, see Interactive installation, upgrade, and setup guides. In previous releases, you could download a .zip file that included the IBM Knowledge Center framework and the full set of Rational solution for Collaborative Lifecycle Management (CLM) Help. In 6.0.3, the Knowledge Center framework is included with the Jazz Team Server and is installed as a .zip file in the jazz-team-server-install-dir/kcci_install directory. Extract the contents of the .zip file. Then download a .zip file that includes the CLM Help content, and extract that .zip file into the kcci_install directory. For details, see Installing help on your computer. 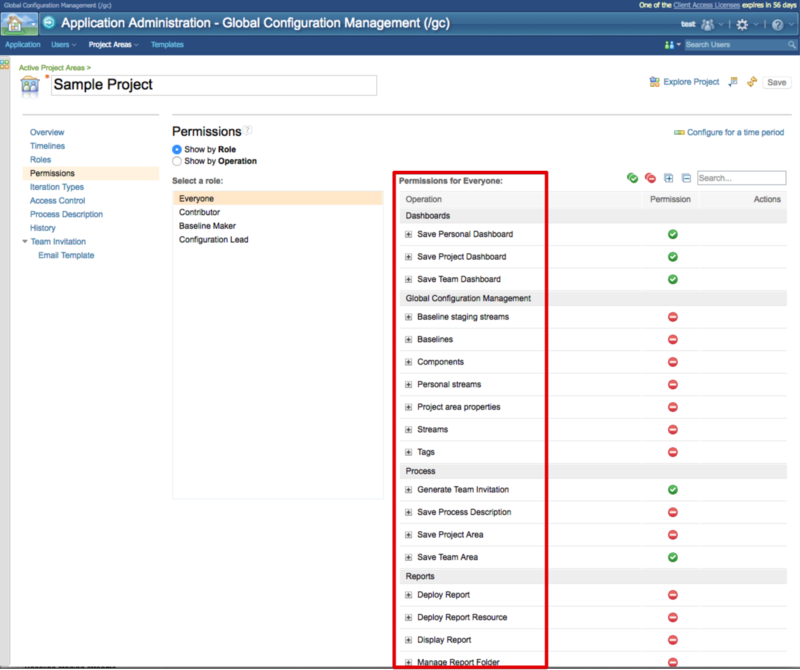 Labels for these project area permission groups have changed to be more consistent with other CLM applications: Dashboards, Global Configuration Management, Process, and Reports. This change affects only the labels you see; it does not affect how permissions are assigned to users. CLM Server Monitoring, a performance monitoring utility included in versions 5.0.2 and later, was removed in 6.0.3. Version 6.0.3 includes a new, lightweight monitoring utility that uses industry-standard MBeans and that can be consumed by other application monitoring services. For more information about server performance and monitoring, see Plan Item 396673, Work Item 392897, and the Deployment wiki article about Known Expensive Scenarios. The CLM solution now provides application-level and scenario-level data for operational monitoring tools, which are published as Java Management Extension (JMX) MBeans. To help monitor the overall health of a production system, application metrics are now available in the form of MBeans. These MBeans can be integrated into most enterprise-monitoring tools and can help analyze trends and report on operational data. To publish the MBeans, you must enable them from the Advanced Property section of the application administration page. For details about MBeans, see the CLM Monitoring Managed Beans Reference on the Deployment wiki. The application administration page contains a new Serviceability section. This section lists scenarios for the application that can use a large number of system resources, which can degrade server performance and negatively affect the user experience. Administrators can turn verbose logging for these scenarios on and off. Verbose logging enables a debugging mode for a subset of Java classes associated with specific scenarios so that administrators can determine whether the scenarios are affecting system performance. For details about these scenarios and options for managing them, see the Jazz.net Deployment wiki: Known Expensive Scenarios. You can now update a stream to use the same configurations as a baseline. This operation simplifies changing a hierarchy of configurations to use more recent baselines, or rolling back to previous baselines. For example, you can update a global stream used by your team to match a global baseline produced by another team. 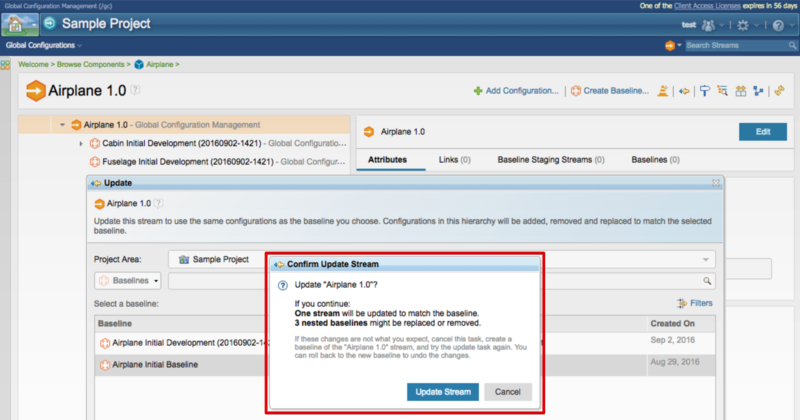 As your team develops a product variant, you can update your stream with baselines produced by the platform team, to use more recent versions of common components. Streams and their location in the hierarchy do not change, unless they are removed. Baselines are replaced to mirror the baseline hierarchy that you update from. To use this feature, right-click a global stream and click Update; then, select a baseline. You can now add global configurations from other project areas managed by the same GCM application using the Project Area list. Use the new All project areas option to search for global configurations across project areas that you have access to. You can select several global configurations from the same page of the results to add more than one at once. The last application that you select in the Add Configuration dialog box is displayed the next time that you open the dialog box. See Work Item 343851, Work Item 388218, and Work Item 340989. Archive nested global configurations by using the new option in the Confirm Archive window. Global configurations that are used by other active configurations are automatically excluded. 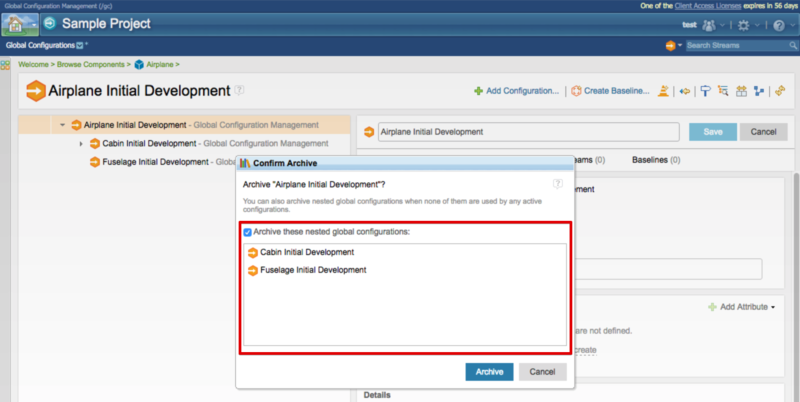 This feature provides more automation for archiving global configurations that you no longer use. The Unarchive button on archived configurations has been relabeled Restore. When you create or stage a baseline, you now see a preview of the configurations to be created. Configurations that do not have unique names are identified so that you can pick a non-conflicting name. 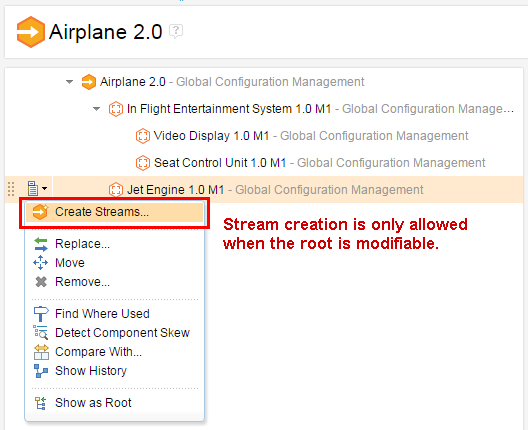 To focus on a section in a configuration hierarchy, use the new Show as Root operation on child nodes to open the configuration tree with the selected configuration as the root. Name uniqueness rules are enforced for new artifacts and when renaming an existing artifact. However, existing name collisions are not changed. Component names must be unique within a project area. 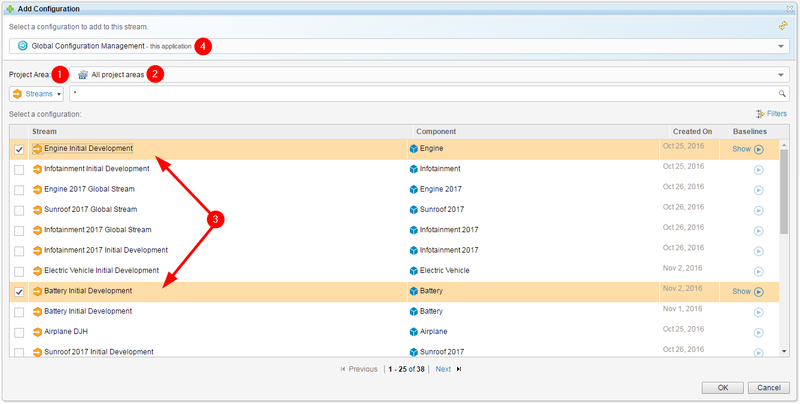 Configuration names must be unique within a component. The indicator is much more visible—a bar at the top of the tree. See Work Item 390521 and Work Item 390267. The Create Baseline operation no longer navigates away to the baseline, but instead remains in the stream hierarchy where the request was initiated so you can do further work on the stream. A message provides a link to the baseline. 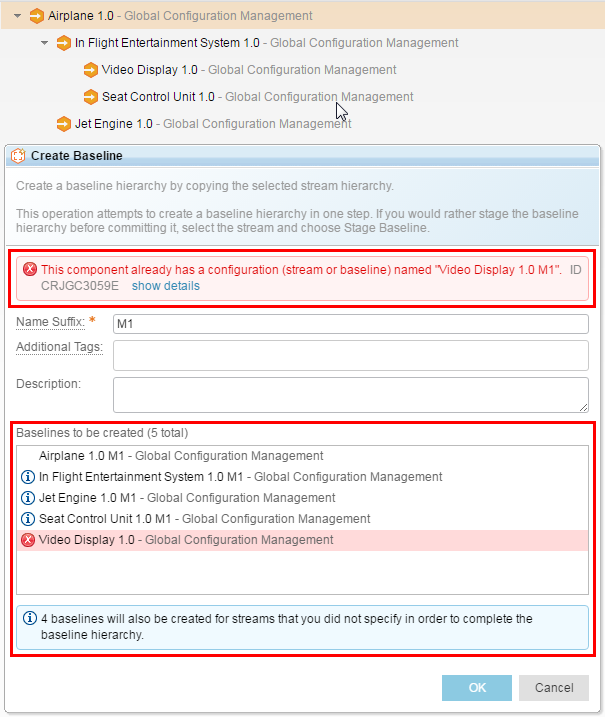 In 6.0.2, configuration leads could create a stream from a baseline that was in the middle of a baseline hierarchy; however, the new stream was not added to the hierarchy because it was not modifiable. The 6.0.3 release simplifies this scenario. Now, configuration leads can create a stream from a baseline only if the root of a hierarchy is modifiable (a stream). Since you can add global configurations from other project areas, the details show where the configuration is from (which determines the governing permissions and project properties).